Happy October! And a happy October it is too! The fires are out!! The weather finally turned to cool, rainy, and even snow. The air is clear again and the fall colors seem so brilliant after the gray smokey days. Fall is definitely here! We really would like to thank everyone for your concern and support! Many have come in and have e-mailed. We are so happy to get back to doing normal things! I got to go on a retreat and I actually got a quilt top completed for a store sample! I am behind however on my hand stitching! Toni has some treats up her sleeve to share! 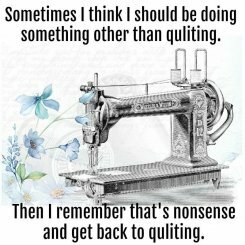 Come sew or just visit and eat! Several people could not make the 1st class with Teresa so she is offering another class. 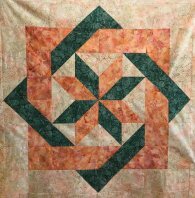 Teresa is going to teach you the basics of quilting with your own machine! Dropping your feed dogs and going for it does not have to be a scary thing again! This class will give you all the confidence you need. 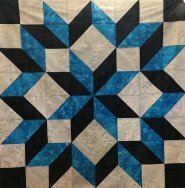 Join Sharon as she guides you in making this stunning quilt that is so much easier than it looks! 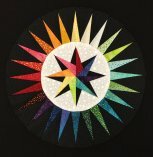 You can also choose to do a regular Carpenter's Star setting as the fabric requirements are the same. 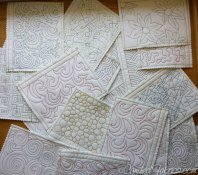 Sharon has done both quilts and you get to decide which version to do....hmmmmm?? purple/teal/green batiks. Everyone voted for jewel tones and we think it will be fabulous. Shown are the blocks Sarina has made. We do have a few kits left if you can't join us. We can mail them to you! 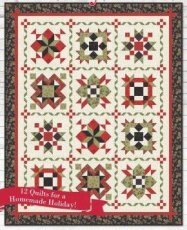 The book is $19.95 to be paid at the first month and the fabric kits are $18.50. Finished quilt size is 58 1/2" x 73 1/2". The Delectable Mountain block is so versatile and can be set in many ways. LaRee will show how quick this block can be. It is perfect the perfect time to make a seasonal table runner. Once you have the block down, the possibilities are endless!